Last year I found a company called SunFounder that makes great Raspberry Pi-related kits and stuff. I got their Raspberry Pi 10" Touchscreen LCD and enjoyed it very much. This month I picked up the SunFounder PiCar 2.0 kit and built it with the kids. 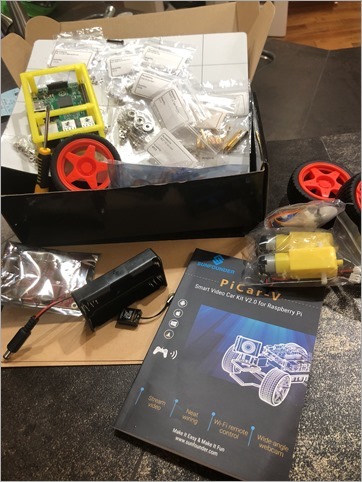 The kit includes everything you need except for the Raspberry Pi itself, a mini SD Card (the Pi uses that as hard drive), and two 18650 rechargeable lithium batteries. 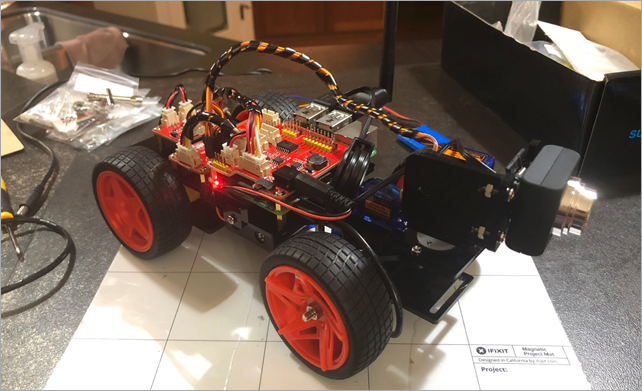 Those batteries are enough to power both the Pi itself (so the car isn't tethered) as well as provide enough voltage to run the 3 servos AND motors to drive and steer the car around. You can also expand the car with other attachments like light sensors, line followers, and more. 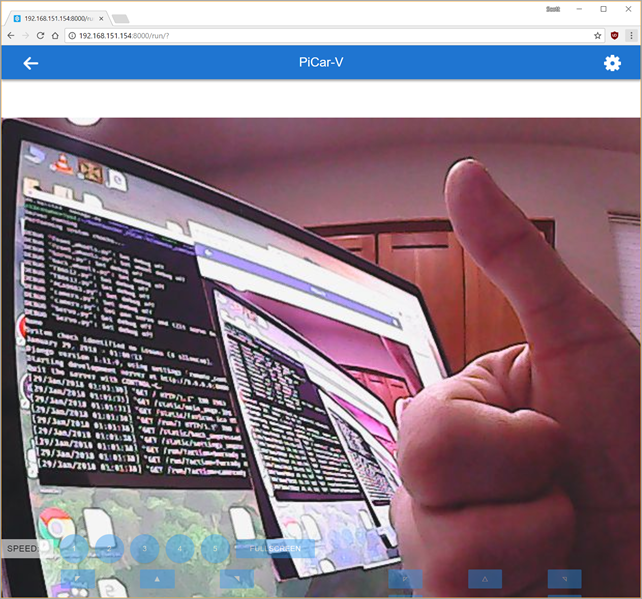 The PiCar 2.0 includes the chassis, a nice USB WiFi adapter with antenna (one less thing to think about if you're using a Raspberry Pi like me), a USB webcam for computer vision scenarios. It includes a TB6612 Motor Driver, PCA9685 PWM (Pulse Width Modulation) Servo Driver with 16 channels for future expansion. The kit also helpfully includes all the tools, screwdriver, wrenches, and bolts. 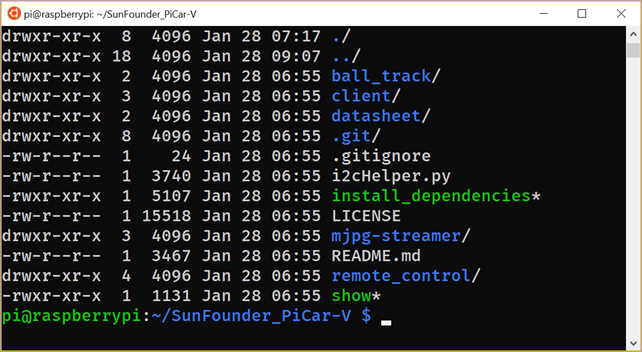 All the code for the SunFounder PiCar-V is on GitHub and while there can be a few hiccups with some of the English instructions, there are a bunch of YouTube videos and folks online doing the same thing so we had no trouble making the robot in a weekend. You'll need to use a tool like Etcher.io to burn a copy of the Raspbian operating system on to a mini SD card. I prefer to save time and avoid having to connect a new Raspberry Pi to HDMI and a mouse and keyboard, so I get the Pi onto my wifi network and enable SSH by copying these two files to the root of the file system of the freshly burned mini SD card. This will cause the Pi to automatically join your network when it boots up for the first time. Then I used Ubuntu on Windows 10 to ssh into the Pi and follow the instructions. 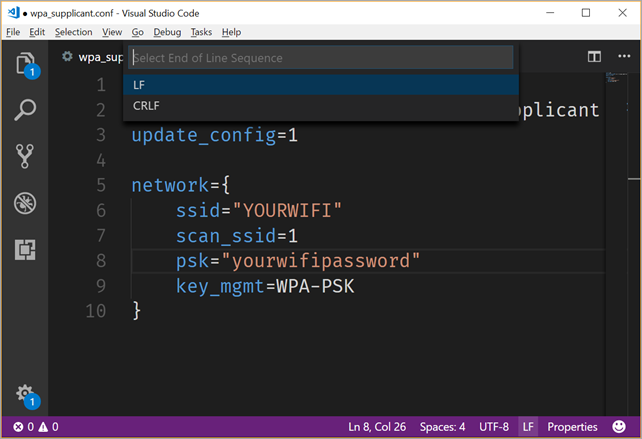 Make a file called "wpa_supplicant.conf" with just linefeeds at the end and make it look like this. Copy it to the root of the new PI disk. I like to use Notepad2 or Visual Studio Code to change the line endings of a file. You can see the CRLF or the LF in the status car and click it. Unix/Raspbian/Raspberry Pi likes just an LF (line feed) for the lineending, while Windows defaults to using CRLF (Carriage Return/Line Feed, or 0x13 0x10) for text files. Once you've built the PiCar you can ssh in and run their development server that gives you a little WebAPI to control the car. The SunFounder folks are pretty good at web development (less so with mobile apps) and have a nice Django app to control the PiCar. You're able to control the PiCar from this web interface with the keyboard. You can move the car and steer with WASD, as well as move the head/camera independently. You will need to enter the settings area (upper right corner) and calibrate the back wheels direction. By default, one wheel may go the opposite direction because they can't be sure how you mounted them, so you'll need to reverse one wheel to ensure they both go in the same direction. 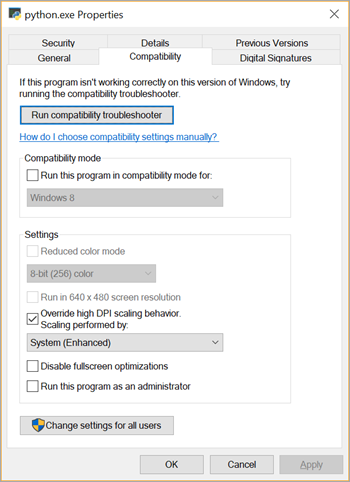 You'll need to run "pip3 install requests" as that module isn't installed by default. Additionally, Python apps aren't smart about High-DPI displays, so I went to C:\Users\scott\appdata\local\Programs\Python\Python36 and right click'ed the Python.exe and set the DPI setting to "System (Enhanced)" like this. The client app is best for "Zeroing out" the camera and wheels, in case they are favoring one side or the other. 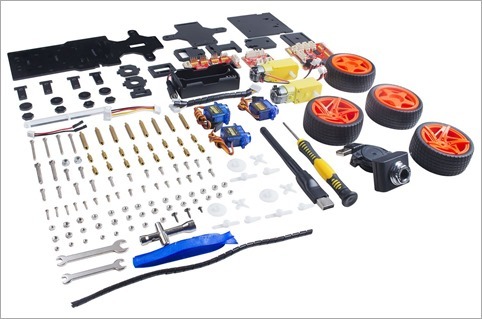 All in all, building the SunFounder "Raspberry Pi Video Car Kit 2.0" with the kids was a great experience. The next step is to see what else we can do with it! Add a speaker so it talks? Add Alexa support so you can talk to it? 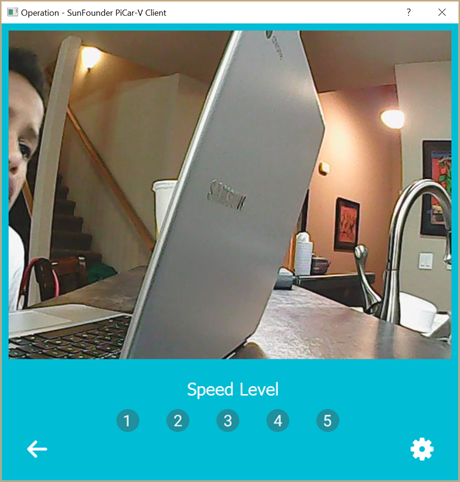 Make the car drive around and take pictures, then use Azure cognitive services to announce what it sees? Or, as my little boys say, "add weapons and make another bot for it to fight!" * I use Amazon affiliate links and appreciate it when you use them! It supports this blog and sometimes gives me enough money to buy gadgets like this! Sponsor: Unleash a faster Python! Supercharge your applications performance on future forward Intel® platforms with The Intel® Distribution for Python. Available for Windows, Linux, and macOS. Get the Intel® Distribution for Python Now! Any thoughts on using ROS (Robot OS) on it? Looks very good, like Optimito!!! Loved the project. I'm currently doing my own remote control car 2.0 using a rasberry pi. First project we bought a remote control car and stripped it. We kept the motors for the wheels and use a rasberry pi to control them. Then I made a simple Android interface and was able to control my car with my Android using my WiFi. I use to have a small delay between the Android input and what the car actually did. Now that I'm at version 2, We bought a Truck so now we have a webcam on it and a paintball electronic gun on top controlled by a 2 servos to make it turn and go up and down, what do you think would be the best way to control the beast this time. I would like as little dealy as possible. I recently had a non-technical relative try to send me a link to a wonderful graduation video they made on YouTube for a family member. The URL was to their account's admin page, so there was no way to actually see the video. How do you explain that to them? One shout out to smugmug.com for doing this right for photos. Has saved me a lot of time sharing photos.